How to paint a female superhero X 23 from X-men. 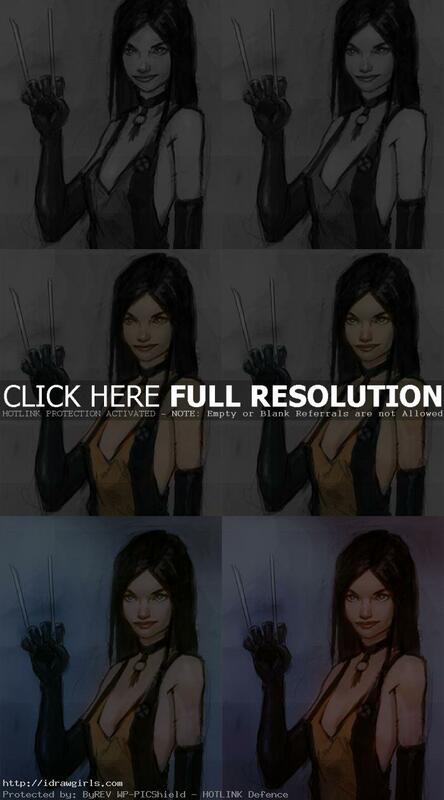 Learn to paint a comics book character X 23. This tutorial is a part two continue from how to draw X 23 tutorial. In this lesson, you will learn how to paint over a finish drawing of a female character with her costume. Before you paint you should already know basic light and shadow or value. I usually start painting with achromatic or monochromatic before I add color. It is a simpler and easier painting process, especially when you are painting without reference. As you progress in painting, the more efficient you become, the easier painting with color will comes to you. But if you are just starting out, I would recommend using monochrome as a stepping stone. As you will see in this step by step tutorial, it is not that difficult once you have the value nailed down. When a top-secret program attempted to recreate the original Weapon X experiment that involved the feral mutant Wolverine, they failed to secure a test subject who could survive the bonding process of the virtually unbreakable metal Adamantium to their skeleton. Seeking to take the project in a new direction, the project’s director recruited renowned mutant geneticist Doctor Sarah Kinney and tasked her with creating a clone. Then she gave birth to X 23. X-23 was raised in captivity and trained to be a weapon. Here is a quick color sketch of X 23, Laura Kinney. Below are step by step painting X 23, Laura Kinney, process. Step one is an original drawing I have from previous drawing tutorial. Step two, I clean up her face and skin part of her body by using soft brush or smooth tool. Step three, I put color over her skin and uniform. You can achieve this by using overlay or color layers. Step four, at this point I paint darker value of the base color on her face, some muscle definition on her arm, and basic shadow on her chest. Step five, I change the background color then lighten up her skin tone a bit. Step six, I tweak the overall color a bit using color balance mode under image command. Very useful tool in Photoshop. Then the quick color sketch is done. I was going to spend more time painting this, but it will take a lot longer. I might come back and finish this one up some time in the future. Then, here it is. Like I said earlier that I was not satisfy with the earlier version. So I decided to show most of the body then start painting it over. Now, I like the final version a lot better than the last image from the previous steps. More character painting tutorials with videos.